If you are looking for something to refresh your casual or beach outfits, pay your attention to white shorts. At first sight it seems that it’s a very easy-to-combine piece of clothes, nevertheless you need some advice to make it right. Today I’ve collected several looks that you can repeat and feel comfy and stylish every day and in any occasions. The most popular white shorts are shorts from denim, this fabric is very strong and shorts fit any body shapes. If you’re a petite woman, try to wear mini shorts, cause they visually lengthen your legs. For pear shaped figure pick up Bermuda-length shorts, and if you’re plus sized, choose knee length shorts. 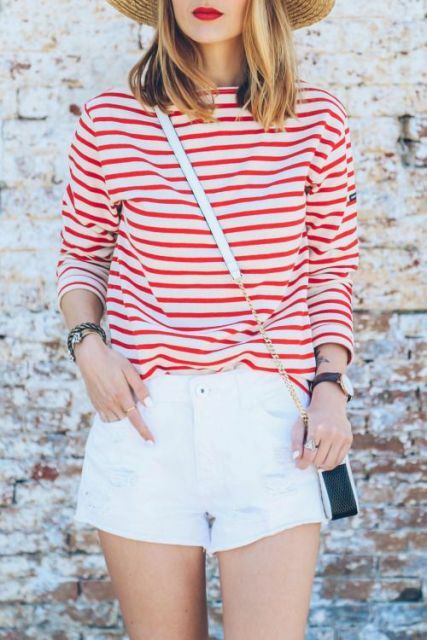 You can find very trendy denim shorts with a raw hem (or you can make them yourself if you have free time and patience) and style them with your favorite t-shirts or tank tops. 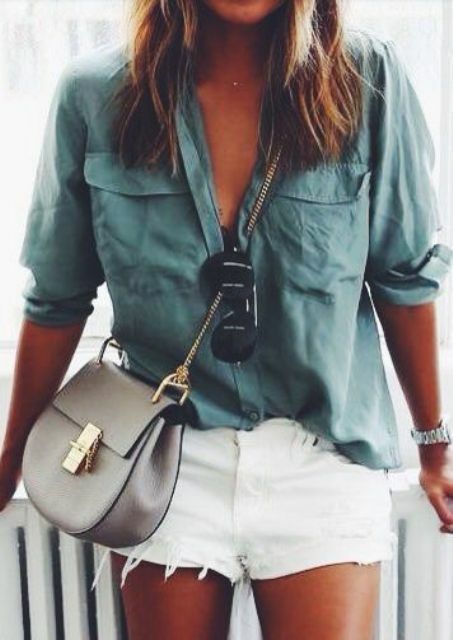 Just add brown lace up flat sandals or heels that will elongate your legs and you’ll get a very summer-screaming and trendy outfit. They also look adorable with classic button down shirts and jackets. If you’re thinking about matching colors of other clothes, I have great news for you – these shorts are good with all shades and colors, so it’s one more reason to choose them for adding to your outfits. For the beach pick up colorful or printed shirts (striped print shirts will be great for nautical outfits). And of course you can get totally awesome looks with white shirts or blouses. If you wanna a more gentle look, try to find white lace shorts. You can pair them with pastel shade tops and sweatshirts. And of course don’t forget about accessories: you can add some eye-catching necklaces and bangles, straw hats and sunglasses. If you’re understanding right now that you need white shorts, you can scroll down and find more stylish ideas!